What is Bravecto for Cats? Bravecto for Cats is a safe and effective topical flea and tick treatment that provides up to 12 weeks of protection. It is indicated for the treatment and prevention of flea infestations (Ctenocephalides felis) and the treatment and control of black-legged tick (Ixodes scapularis) infestations for 12 weeks in cats and kittens 6 months of age and older, and weighing 2.6 lbs or greater. This easy-to-apply formula also treats and controls Dermacentor variabilis (American dog tick) infestations for 8 weeks. With one application, Bravecto for Cats will protect your cat against fleas for three times as long as most leading flea and tick preventatives. This means less of a chance of missing a dose, making it easier to keep your cat protected year-round. One dose effectively breaks the 3-month flea life cycle, from egg to adulthood. Bravecto for Cats requires a prescription from your veterinarian. NOTE: To protect dogs against fleas and ticks for up to 12 weeks, use Bravecto Chews for dogs or Bravecto Topical for dogs. How does Bravecto for Cats work? 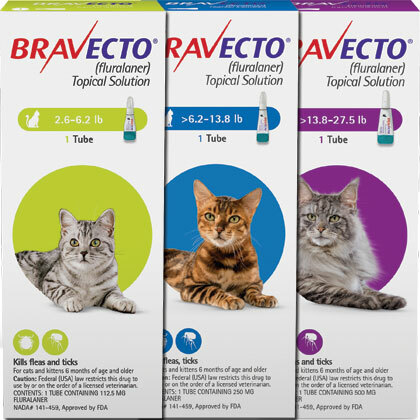 After applying Bravecto for Cats, the medication quickly reaches tissue fluids under your cat's skin. When fleas and ticks feed on your cat, they ingest Bravecto for Cats and die. Bravecto for Cats kills fleas, prevents flea infestations and kills black-legged ticks for 12 weeks. Bravecto for Cats also treats and controls American dog ticks for 8 weeks. Not for human use. Keep this and all drugs out of the reach of children. Do not contact or allow children to contact the application site until dry. Keep the product in the original packaging until use in order to prevent children from getting direct access to the product. Do not eat, drink or smoke while handling the product. Avoid contact with skin and eyes. If contact with eyes occurs, then flush eyes slowly and gently with water. Wash hands and contacted skin thoroughly with soap and water immediately after use of the product. The product is highly flammable. Keep away from heat, sparks, open flame or other sources of ignition. For topical use only. Avoid oral ingestion. Use with caution in cats with a history of neurologic abnormalities. Neurologic abnormalities have been reported in cats receiving Bravecto, even in cats without a history of neurologic abnormalities. Bravecto has not been shown to be effective for 12-weeks duration in kittens less than 6 months of age. Bravecto is not effective against Dermacentor variabilis ticks beyond 8 weeks after dosing. The safety of Bravecto has not been established in breeding, pregnant and lactating cats. What is the most important thing I should know about Bravecto for Cats? Bravecto for Cats contains the active ingredient Fluralaner. It is indicated for the treatment and prevention of flea infestations of cat fleas (Ctenocephalides felis), and the treatment and control of tick infestations of black-legged ticks (Ixodes scapularis) for 12 weeks in cats and kittens 6 months of age and older, and weighing 2.6 pounds or greater. Bravecto for Cats is also indicated for the treatment and control of American dog tick (Dermacentor variabilis) infestations for 8 weeks in cats and kittens 6 months of age and older and weighing 2.6 pounds or more. Bravecto for Cats requires a prescription from your veterinarian. 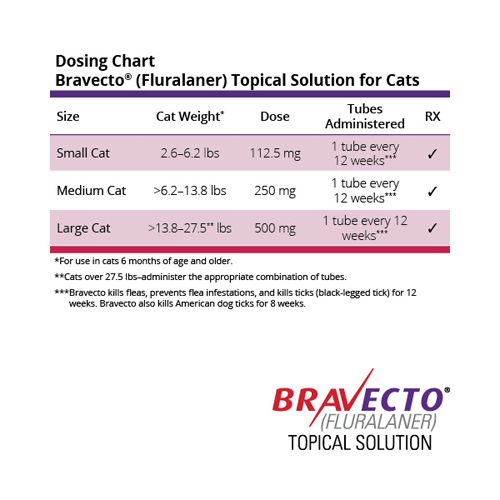 Bravecto for Cats is available in three strengths for use in cats (112.5 mg, 250 mg, and 500 mg fluralaner per tube). Each tube is packaged individually in a pouch. Bravecto for Cats has not been shown to be effective for 12-weeks duration in kittens less than 6 months of age. Bravecto is not effective against Dermacentor variabilis ticks beyond 8 weeks after dosing. The safety of Bravecto has not been established in breeding, pregnant and lactating cats. What should I discuss with my veterinarian before giving Bravecto for Cats to my pet? Tell your veterinarian if your cat has a history of neurological problems. Bravecto for Cats should be used with caution in cats with a history of neurologic abnormalities. Neurologic abnormalities have been reported in cats receiving Bravecto, even in cats without a history of neurologic abnormalities. Also tell your veterinarian if your cat is used for breeding, or is pregnant or lactating. How should Bravecto for Cats be applied? Bravecto for Cats should be administered topically as a single dose every 12 weeks according to the dosage schedule (How to Use tab) to provide a minimum dose of 18.2 mg/lb (40 mg/kg) body weight. Treatment with Bravecto for Cats may begin at any time of the year and can continue year round without interruption. What are the potential side effects of Bravecto for Cats? In a well-controlled U.S. field study, there were no serious adverse reactions. Possible side effects may include vomiting, pruritus, diarrhea, alopecia, decreased appetite, lethargy, or scabs/ulcerated lesions following application. What happens if I miss giving a dose of Bravecto for Cats? Give the dose when you remember and resume the normal application schedule of one application every 12 weeks. What happens if I overdose my pet on Bravecto for Cats? What should I avoid while giving Bravecto for Cats to my pet? Bravecto for Cats is for topical use only. Avoid oral ingestion. What other drugs will affect Bravecto for Cats? There are no known contraindications for the use of Bravecto for Cats. Bravecto for Cats should be administered topically as a single dose every 12 weeks according to the Dosage Guidelines below to provide a minimum dose of 18.2 mg/lb (40 mg/kg) body weight. Bravecto for Cats may be administered every 8 weeks in case of potential exposure to Dermacentor variabilis ticks. Immediately before use, open the pouch and remove the tube. Hold the tube at the crimped end with the cap in an upright position (tip up). The cap should be rotated clockwise or counter clockwise one full turn. The cap is designed to stay on the tube for dosing and should not be removed. The tube is open and ready for application when a click is heard or felt. This indicates that the seal is broken and product can be applied to your cat. The cat should be standing or lying with its back horizontal during application. Part the fur at the administration site. Place the tube tip vertically against the skin at the base of your cat's skull. Squeeze the tube and gently apply the entire contents of Bravecto for Cats directly to the skin at the base of your cat's skull. Avoid applying an excessive amount of solution that could cause some of the solution to run and drip off of your cat. If a second spot is needed to avoid run off, then apply the second spot slightly behind the first spot. Administer the appropriate combination of tubes as per dosage chart above. Do not store above 86F (30C). Store in the original package in order to protect from moisture. The pouch should only be opened immediately prior to use.